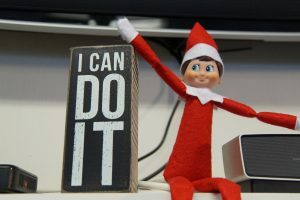 I am an elf in Santa’s Workshop, and Santa sent me to Get 2 the Core Fitness to work with Sonia and to inspire my journey to get off my shelf. I admit that my job is very sedentary. This time of year I sit for hours on end, just watching families get ready for the holidays. When I am not on the shelf spying, I sit at a workbench inspecting the quality of the toys we produce. Fitness and nutrition has never been a priority at the North Pole. The traditional elf diet consists primarily of sugar, most often in candy or syrup form. The reindeer get to work out regularly, but the rest of us do not have access to a gym or weights. The North Pole is a lovely place, but this time of year we never see the sun. This makes us quite irritable until the sun comes back in the spring. I am so excited to work with Sonia. I have read the inspiring stories of her other clients, and already she told me studies show that moderate exercise can help with mild depression (although she did note that if I or any of my co-workers are severely depressed or need help to be sure to seek professional help). I am excited to try her recipes, and am ready to get up off my shelf! JOIN ME!